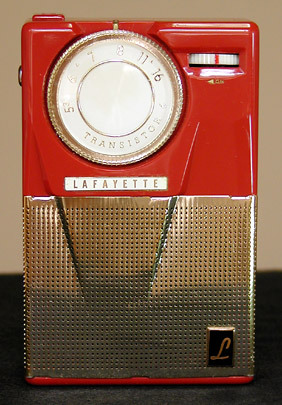 Lafayette Radio of New York sold this OEM version of the Standard SR-F22 under their own model number "FS-110". I'm not sure exactly when sales began, but both radios you see here were built in or around April 1958. The gold rimmed tuning dial and gold speaker grille make this one of the most beautiful SR-F22 variations in my book. I also happen to be particularly fond of the vermilion cabinet of the unit on the right. For more general information on this model, see my pages covering the Standard SR-F22. 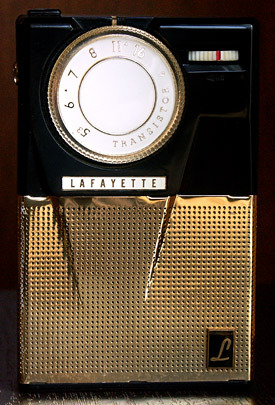 And, for another SR-F22 variation that looks even more like this radio, check out the Mignon.